(Newser) – Two New York City police officers responding to a robbery in the Bronx were shot and wounded last night and a manhunt is underway for at least two suspects, authorities say. The officers were taken to St. Barnabas Hospital in the Bronx with non-life-threatening injuries. One officer was wounded in the arm, and the other was struck in the back, police say. The commanding officer of the NYPD's public affairs unit says the officers were not targeted—unlike two officers shot to death nearly three weeks ago in their patrol car in Brooklyn—but had just arrived at the scene. I guess turning your back on the mayor has consequences. This should make the newser liberals really happy. Do gangs wear primary one color? Do they all have weapons and guns? When you kill or injure one of the gang members, does the entire gang stop and search for this person? 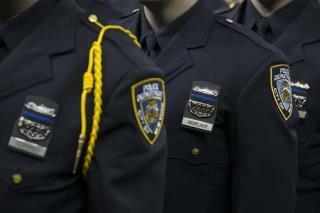 NYPD is the biggest gang in New York State. Remember that when another "thug" (cop) gets shot!